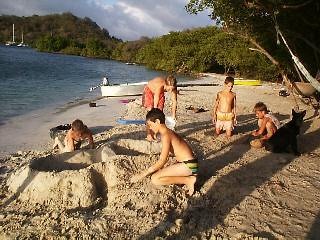 I have very fond memories of Hog Island, Grenada. I made my first friends there, Ben and Tristen on a boat called Steadfast, then Jamie and Alexie on Island Dancer, both from the United Kingdom. Roger, the Rasta owns the bar on the beach. The bar is made out of palm leaves and bamboo, and, at the front of the beach, it almost completely blends in. If Roger is not at the bar you will find him dozing under a palm tree in a hammock, finding him is not a problem, it's waking him up that takes time. My friends and I enjoyed each other's company. We often played on the mud at low tide, having mud fights and loads of fun. The path that goes around the periphery of the island is littered with leaves and twigs. On the beaches around the island there are many Coconut crabs. These crabs make a very tasty meal and one of the ways to catch them is by placing a fresh mangrove leaf about a foot away from the hole, and wait. I was sad when it was time to leave, but as what normally happens when cruising you bump into people you know at the most unlikely places. Hog Island was once a preserve for wild hogs, thereby earning it it's name. My friends and I liked to scare each other, and say that there are still some wild boars in the heart of the mangroves, and who knows, maybe there are. When we left Grenada we set sail for Tyrell Bay, passing over Kick 'em Jenny, an active underwater volcano, the seas are very rough over this particular point, and the water temperature increased 10 to 15 degrees Celsius above normal here. Tyrell Bay anchorage was very rolly, we only spent a night leaving the following morning for Sandy Island. Sandy Island was typically tropical, white sandy beach, crystal clear turquoise water, palm trees blowing gently in the breeze, the sun beating down overhead, making the water dance. This was my picture perfect tropical island. Jack, our dog had fun trying to catch fish in the gently lapping waves. I felt like I was dreaming, lying in the shade of a palm tree, hot sand on my back, and the rippling water touching my toes every now and then, I gave a small sigh, I was finally in paradise. When we left Sandy Island we went to Chatham Bay, Union Island. We stayed there for a few days exploring the tropical underwater caves that surrounded us. Looking out of a cave into the sunlight water is one of the most beautiful sights. The water was shimmering like a silver silk coat and the fish, angel fish, butterfly fish and parrotfish gliding through it. No picture could have expressed the beauty. We were sitting in the cockpit cooling off with a glass of ice tea, when we saw what appeared to be wings in the water. Mom and I hopped into the dinghy and drove slowly towards the shadow. Plopping into the water I could of jumped with excitement, but of course being in the water it was slightly awkward. A huge Manta Ray swam past me, my finger tips only inches away from her body. There was a plop beside me and mom was in. I couldn't hear what she said but judging by the size and number of bubbles that issued from her mouth my guess was that she was excited. We swam with the manta for about fifteen minutes before with a gentle flick of her huge wings she disappeared into the depths of the blue. We met a South African boat here called Khayamanzi, meaning House on Water in Zulu.